3Boil the cream for a minute or so. You want to thicken it up a bit. Then mix the spinach and cream together. 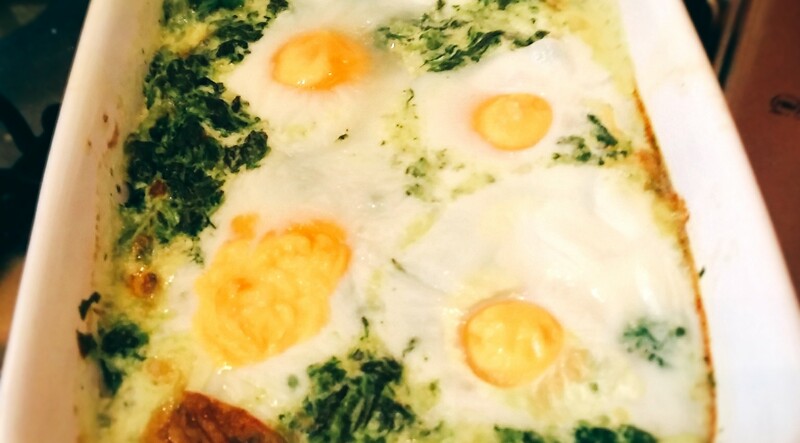 4Put the spinach in baking dish, make 4 wells for the eggs and crack the eggs into the wells. 5Place the baking dish into a bigger baking dish/tray and fill about 1-2 cm with boiling water. 5Whisk well and gradually add in the butter. Jamie's Tip: Keep an ice cube readily available at this stage. If you can see that the mixture is starting to split, drop in the ice cube and whisk it in. This can save the hollandaise sauce!